What was I doing in Utah, you ask? Last month I went to review the 2013 Hyundai Santa Fe. I was “on assignment” for The Vacation Gals. The car has great “road-tripability,” and you can read about my experience driving the new Santa Fe here. 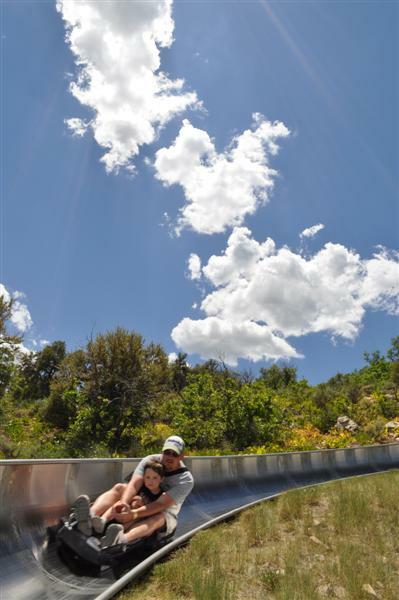 The Alpine Slide is similar in concept to the Luge. You sit in a sled, then set off on your choice of four narrow lanes. The journey takes you down 3,000 feet of banked turns and straight-aways. From what others told me, you control the speed with a central hand brake. While there was a lot to DO at the Olympic Park, there was also a lot to SEE. I was part of a large crowd watching the daredevils at the Freestyle Training Pool. 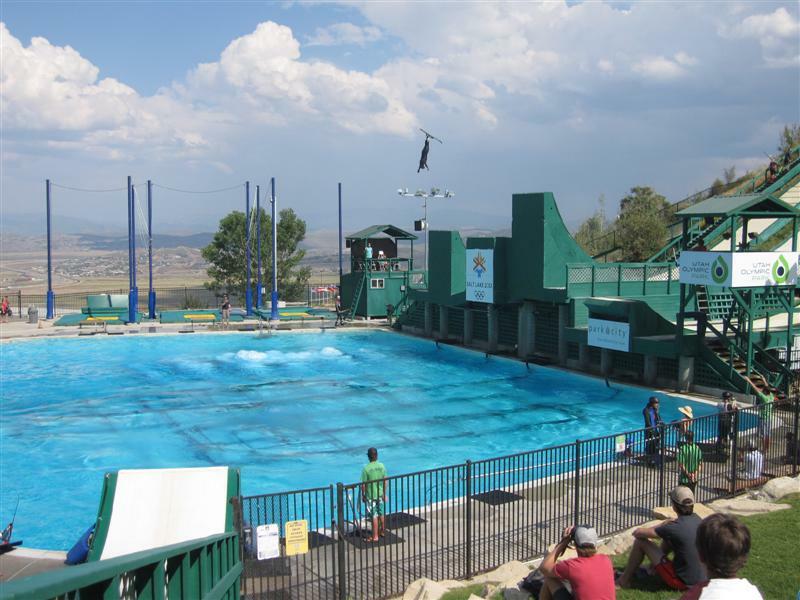 Fearless kids and adults alike took their pick from four slopes of varying lengths and angles to ski down, do a midair flip or two, and land into a swimming pool. Inside the George Eccles 2002 Olympic Winter Games museum, the exhibits focus on the games themselves, which were based in nearby Salt Lake City. Park City itself hosted Nordic ski jumping, bobsled, skeleton, and Luge events. During those events, over 300,000 spectators visited the venue. 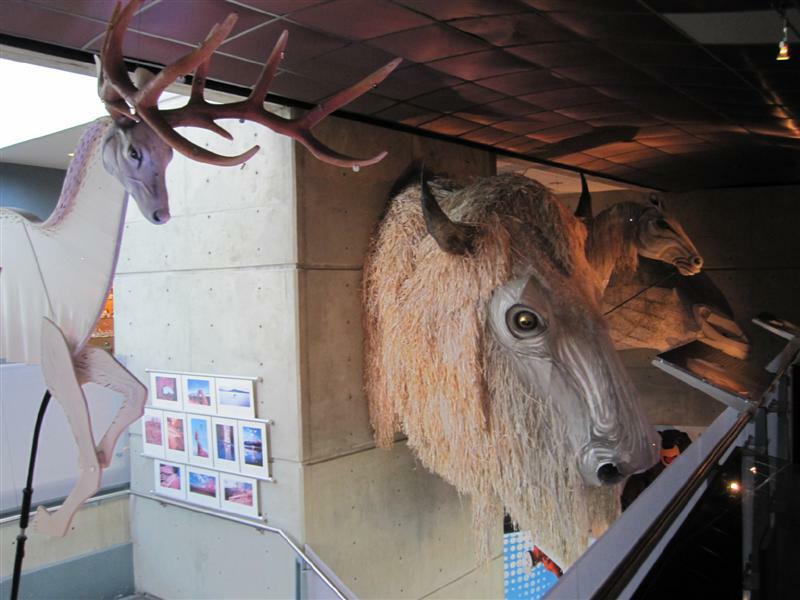 I enjoyed peering into the display case of Olympic medals from the 1920’s through today, and seeing the huge animal puppets (bison, deer, horses, etc.) used during the “Land of Enchantment” program at the opening ceremonies. 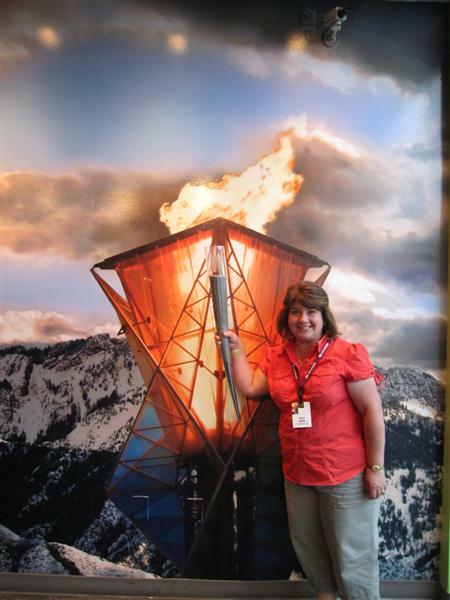 I also carried the torch for the U.S. Women’s Outlet Shopping Team. 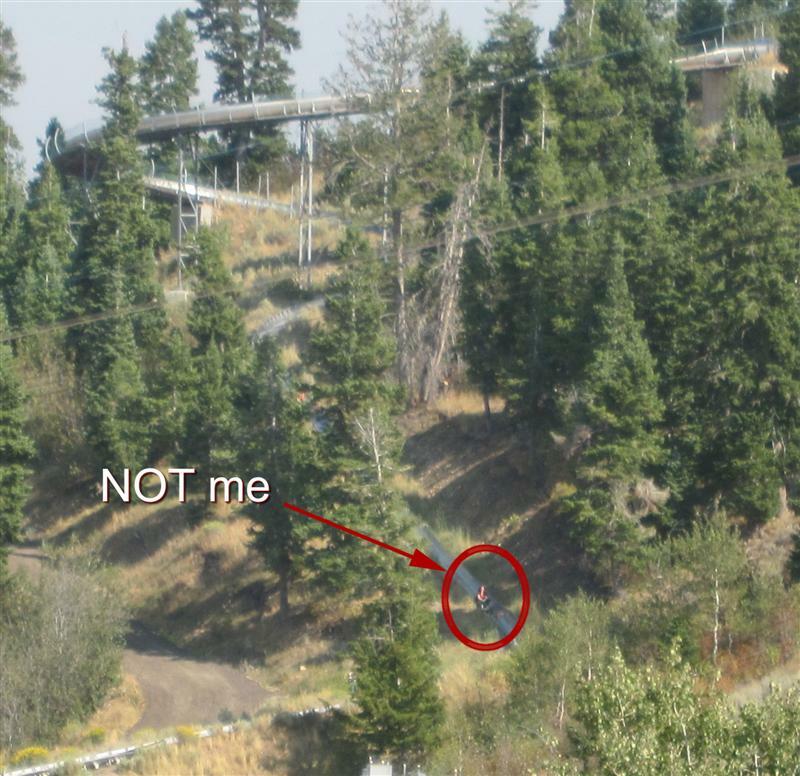 By the way, the World’s Steepest Zipline is another attraction at the Utah Olympic Park. Or so I hear. I know exactly how you feel about the Alpine Slide! Your “wimping out” reminds me of a trip up to the White Mountains of New Hampshire that I was invited on as a birthday party for one of my best friends – we were in 8th grade and there were about 5 of us. I did not even know what an Alpine Slide was, but when we got there, and were told we had to take a ski lift to the top of the hill to then slide down, I was apprehensive, and when I saw the steep incline at the very beginning I totally almost backed out. But I couldn’t because the slide was the only way to get down the bottom, and I didn’t want to seem Lame in front of my pals. My heart still lurches all these years later when I think of that initial drop, but once I was over that, the rest of the ride was actually FUN! I don’t do well with adrenaline, but I’m glad I forced myself to do it. But don’t beat yourself up about it, it looks like you had all sorts of other things to make for a fun day! Thanks for the support, Betty! I knew you would understand! And if the Alpine Slide itself didn’t induce palpitations, surely the chairlift to the top would have! That looks AWESOME!!! You should have just done it. Couldn’t be scarier than walking across the world’s longest suspension bridge. That looks like a whole lot of fun. I wonder if it’s actually possible to fall out…?! From your blog title, I’d expected you to go down the slide. But, thanks for sharing your day. I’ll have to make my way up there sometime. 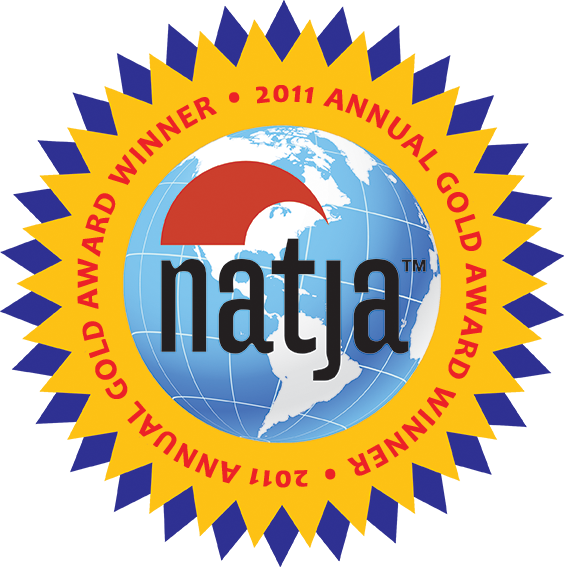 We were there last summer and the kids had a blast on the zip line and luge. Unfortunately i was out-of commission with shoulder surgery. Or so you say. Those pesky shoulder injuries! I lived in Utah for about 4 years and had the chance to go to the Olympic park multiple times. I road the Alpine Slide multiple times and it was a ton of fun. I went with one of my brothers once and we had a lot of fun racing down the slide. The Alpine Slide is better than a normal slide because you can’t simply go as fast as you want, you’ll fly off if you try so you do have to control you speed a little. I think that element of danger is what makes it so much fun. Thanks for sharing your experience, Gabriel! You’re more of a daredevil than I am, for sure. Looks pretty cool…I never though about visiting the Olympic park!